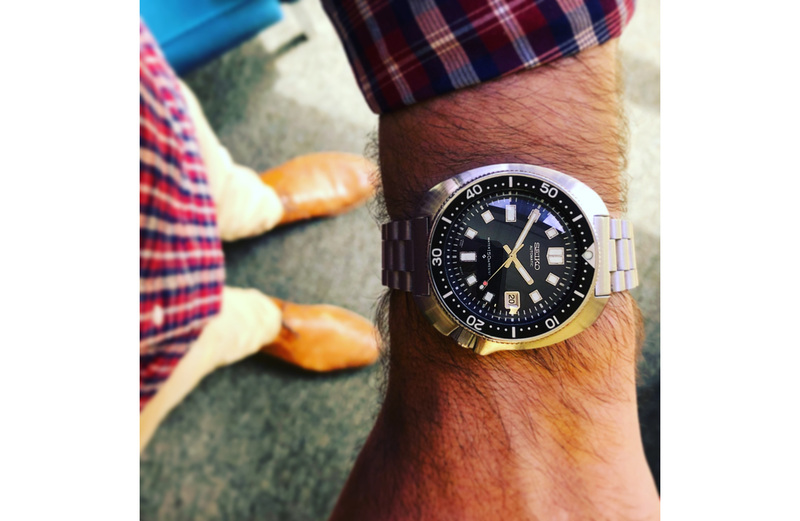 It’s a tale as old as time: Chad meets watches, Chad meets Seiko, Chad meets Instagram, and the rest is, as we say, history. 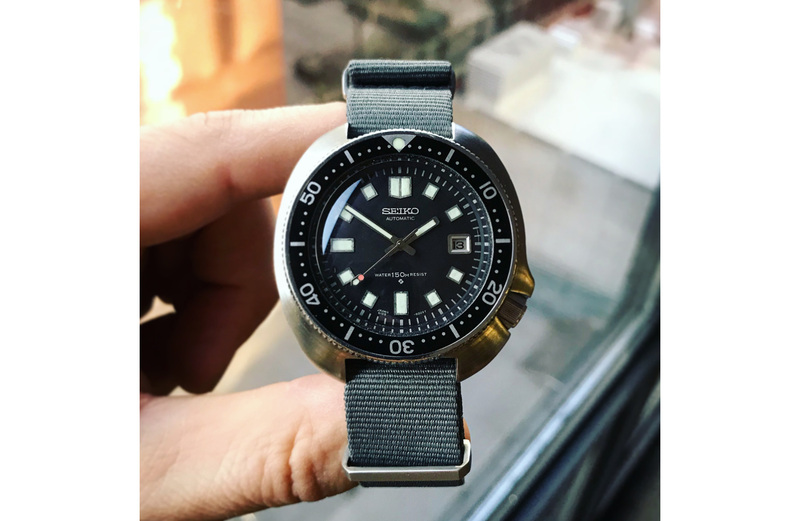 In his own words, Chad tells us his story of buying vintage for the first time, and why he chose the Seiko 6105. When did you first see/hear about it? 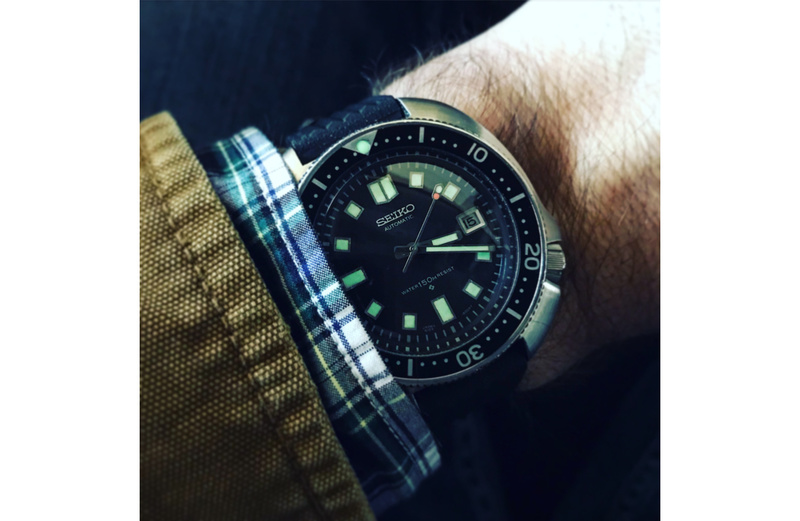 I first learned about the Seiko 6105 shortly after becoming interested in watch collecting about 12 years ago. One of my entry watches was the Seiko SKX007. 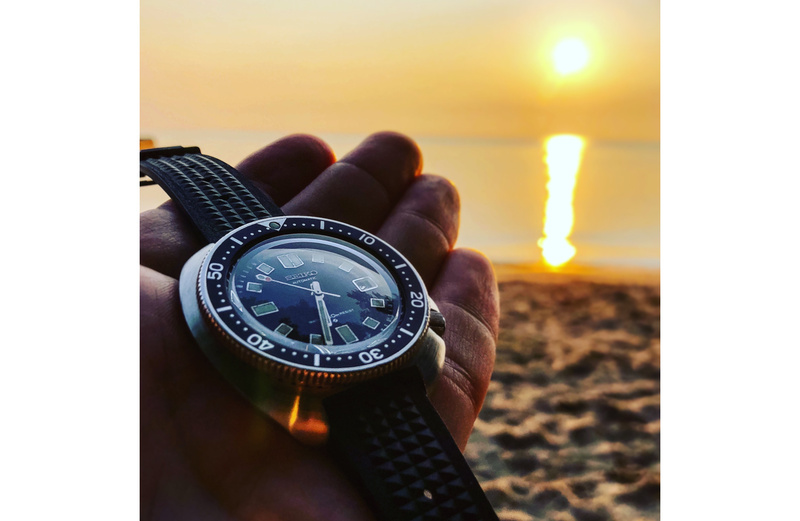 I quickly became curious about other Seiko models and learned that Seiko had a rich history of dive watches. 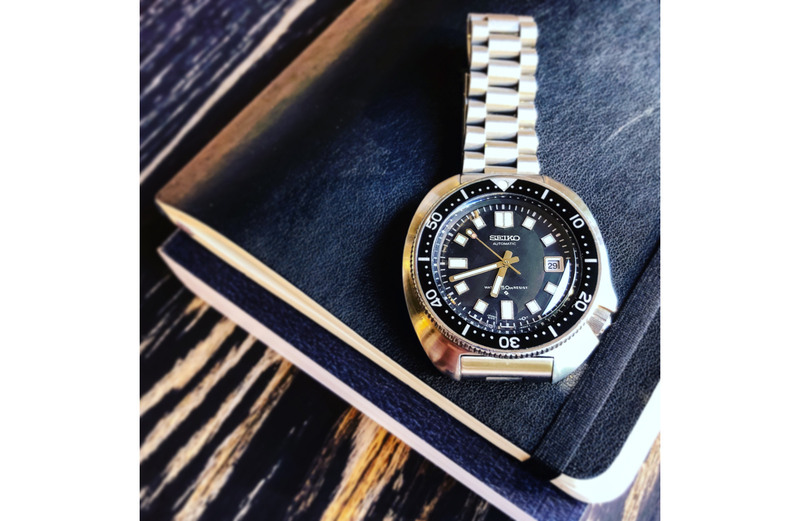 Online forums, like Watchuseek, had many threads that traced the lineage of Seiko dive watches from the legendary 62MAS, released in 1965, up to modern day. I basically fell in love with all of them, but the 6105 really caught my eye. Made from 1970-1977, the 6105 came in two versions: one with a slim case, and one with the more recognisable cushion case. The latter was the one that spoke to me. The shape of the case was so unique and alluring. It somehow looked elegant and rugged at the same time, like a UFO that would be at home in the sea. A beautiful example of ’70s design. I had to have one, but it took another 10 years to find my 6105. Any story behind the purchase? I’m not a great watch “collector” because I’m not very patient. When I decide that I want a watch, I’m not a big fan of waiting for it. I like phrases like “in stock” and “fast shipping”. And vintage watch collecting always seemed a bit dangerous. I encountered many cautionary tales about collectors buying watches that weren’t what they claimed to be. It’s not uncommon for vintage Seiko watches to have replacement/reproduction parts that aren’t disclosed. And the watches that really are in “original” condition often look pretty rough, like something chipped off the bottom of an old ship. Honestly, the challenge of finding a good example of a 6105 was daunting to me. I wanted to find one, but the pitfalls held me back. My searches always seemed to yield watches that would be significant restoration projects or desirable watches well out of my price range, or worse, those that had been bought out from under me. The 6105 sort of became my white whale — something I desperately wanted to capture, but always seemed just out of reach. Then along came Instagram. In 2016 I had the realisation that people were probably posting pictures of their watches on Instagram. And boy, was I right. I was actually late to the party, but I quickly joined in with the #watchfam community, posting watch photos and learning even more about this crazy hobby. One of my Insta-friends acquired two 6105s in a trade, both the slim case and cushion case versions, and both were beautiful examples. I was a bit envious to say the least. I enjoyed seeing his photos and was surprised to see that he put the cushion case model up for sale. He preferred the slim case version and felt he didn’t need both. I messaged him quickly and expressed my interest. We were able to agree on a price that was in my budget and seemed very reasonable for this watch. I was so excited to finally be throwing the harpoon at my white whale. And I almost missed. Ten years of waiting is a lot of pent-up anxiety and excitement. I wanted to make my payment quickly before my friend changed his mind or some other buyer came along offering more. So I did the reasonable thing and tried to complete the payment via PayPal from my car on my way home from work in Chicago traffic. By the time I reached home, my friend still hadn’t received the payment. I realised that in my frenzy I had typed in one wrong letter in the email and sent my payment to Jane instead of James. I had a few minutes of sheer terror, thinking I was not only going to lose my money but the opportunity to own a 6105. I quickly called PayPal and cancelled the payment (sorry Jane) then I contacted my friend to let him know what I’d done and that payment was now on the way. He was very gracious throughout the process. Thankfully, the crisis was averted, and the watch arrived a few days later. I finally had my own 6105. It was better than I imagined and still is. What was the deciding factor? For me the final push over the cliff was the opportunity to buy from a seller that I trusted. I knew that my friend had no incentive to take advantage of me and that the watch was everything it was described to be. Essentially, my fears and anxieties about buying vintage were taken away, and I felt free to take the leap. One of the unique features of the 6105 is the crown lock. The watch does not feature a screw-down crown, but instead a mechanism locks the crown in place to keep it from moving, when you’re not setting the time or date. It’s basically a small steel stem that juts out from the case and stops the crown from rotating when pushed in. While this is an interesting piece of design, it seems to not be very durable. It can be difficult to find the 6105 with a working crown lock, because the locking stem seems prone to breaking over time. My research also suggests it’s very difficult, even impossible, to repair once broken. It doesn’t affect the watch’s function or ability to keep time, but it’s one original aspect of the watch that is rarely seen. I confess that in my frenzy to buy the watch, I overlooked this detail. I’m sure it was included in the description, but all my other boxes were checked. I bought the watch without even considering this feature. I was pleasantly surprised to learn or rediscover that my 6105 does indeed have a working crown lock. It’s an interesting and quirky feature that I really enjoy. When do you wear it? I think a lot of collectors might put a watch like this in the safe or keep it in the watch box most of the time. I like to wear my watches, and for me the 6105 represents such a long search that I have a hard time wearing anything else since I purchased it. I wear it daily for work, around the house, and for social events. I’m very careful with it. I don’t wear it in the water or for activities like exercise or yard work. How does it feel on the wrist? I’m constantly amazed at Seiko’s ability to make larger watches wear well. And the 6105 might be the best example of the brand’s unique capacity for comfortable design. The case is quite slim for a diver. The cushion case slopes away from the bezel and dissolves into the arm. The caseback also has a subtle contour that helps the watch join to the wrist. Although the case is 44mm wide, it really doesn’t feel like it. Do you change straps often? I don’t find myself changing straps on the 6105 as much as I do with my other watches. This is for a few reasons. One of the simplest being that I’m afraid of scratching the case on this special and rare watch. And another is that I happen to think the watch looks best on the Seiko rubber dive straps it was paired with originally for sale. My personal favourite is the rubber “waffle” strap. 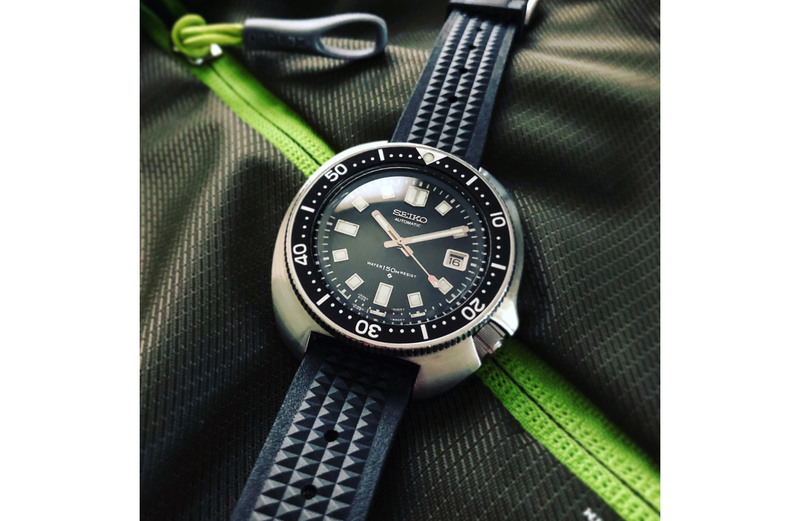 I have a reproduction model of this strap from Uncle Seiko, and I love it. It’s very comfortable and also looks period correct for the watch. At the end of the day, the 6105 is a black dial Seiko diver, so of course it looks good on a variety of NATO straps. And I also have an oyster-style bracelet from Uncle Seiko that I think looks really sharp. I don’t experiment too much with this watch, and like to keep it simple.